In 1983, Japanese toy manufacturer Takara Tomy released the first 3D videogame hardware for the home market with its series of "Tomytronic 3D" handheld electronic games. Unlike SubRoc-3D, which used a single screen that had to be viewed through a separate set of spinning whirlimajigs, Tomytronic 3D cut out the middleman and used two displays, one for each eye, inside a device that the player held to their eyes like binoculars. Seven were released in all, often under several different names for different markets - one of the Japanese games was actually called Jaws 3D, which became the more lawyer-friendly Shark Attack in the United States. Other games included Jungle Fighter, Skyfighters, Sky Attack, Sherman Attack (you may be noticing a recurring theme here), and Thundering Turbo. Instead of using a television, the Vectrex had a built-in monochrome vector display - a technology that seems utterly antiquated now, but was actually superior to contemporary pixel-based graphics in some respects. Vector graphics were used by many contemporary arcade games, which aided in porting them. Sadly, the Vectrex had the misfortune to be released the year before the great videogame crash of 1983, which killed it. It had a few peripherals in its brief life, including the first 3D add-on ever released for a home console. 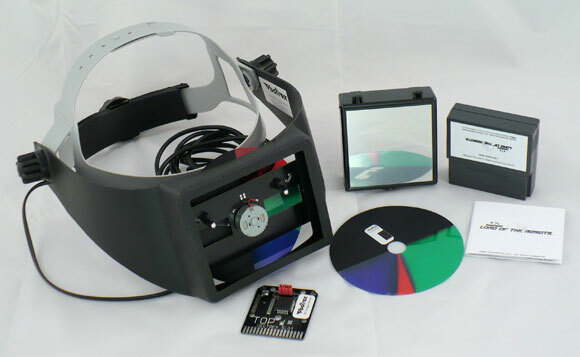 The Vectrex 3D Imager was a set of 3D glasses that worked similarly to SubRoc 3-D, except instead of a pair of disks, the imager contained a single spinning "Color Wheel" that was translucent on one half and black on the other. Different games came with different Wheels, since the vector display was monochrome and used plastic overlays to provide suitable tints for individual games. Only three 3D Imager games were released before the demise of the Vectrex, but it likely wouldn't have taken off even if it had been given more of a chance. There's probably a good reason that nobody else ever tried to market a vector display-based game console, and the track record of subsequent attempts at 3D graphics on home consoles is not encouraging. The Color Wheel also spun fast enough to produce an appreciable gyroscopic effect, making it resistant to being moved. So resistant, in fact, that if the rest of the Imager moved, the Wheel could be jerked out of position by its own rotational inertia. Not a problem for the immobile Subroc-3D eyepiece, but on home consoles you have a problem when a peripheral reacts poorly when the player turns their head. We'll never know for sure, though, so if you want to dream of a world that might have been where the Vectrex 3D Imager ushered in a golden age of 3D and the console war of 2015 is a struggle between the VectrexOne, the Atari Colocolo, and whatever nightmarish obscenity the Virtual Boy might have evolved into after 20 years, go for it.